Forecasts on new markets are like vacations in a foreign land you have little information or experience about: the only sure thing is that the experience will not be like you thought it would. When a new market is created, especially in the tech world, it is always very tempting to assume the best. It is tempting to assume people will jump on this new product or service as quickly as early adopters (they will not, that is why we call the others “early adopters”). It is equality tempting to assume that mainstream users will be as excited about this product benefits as you are. It is also quite optimistic to assume consumers will prioritize the purchase of this new gizmo or service over the many other gizmos and services they already know and want to buy. Years ago, in a previous professional life, I saw a cool new device: the Tivo set-top box (STB). Everyone in my company (Philips Electronics) was super excited about the concept, and explosive growth was expected. The reality was very different. It’s only when Direct TV integrated TiVo in their satellite STB, a device users were going to get anyway, that TiVo reached a growth inflection point. Since then I’ve seen this over and over again, and the dynamic is often the same: If your new service or product requires users to buy something that has no connection with anything you already own or want, it will take a much longer time to grow. Unfortunately, “expert” forecasters will almost always miss this and will generate nice charts with big growth that will never happen as planned. Let’s take a recent example: smartwatches. When the first smartwatches came out, then the Apple Watch, the industry was buzzing about it. It seemed like it was as great a new product category as the smartphone had been when it launched. When I analyzed this, I just could not see how a device that had “diet smartphone” capabilities, was expensive for what it could do, and needed to be recharged every day could be appealing. Back then (2014) I saw this projection and could not believe it. So I kept the link and left a note to myself to check the real numbers a few years later to see if indeed I was misunderstanding a genuinely booming new category… or if once against pundits were over optimistic. Fast forward to today. 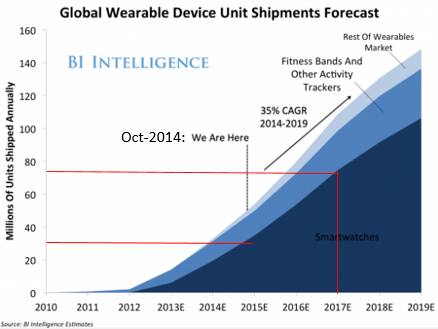 The smartwatch market is clearly not what was predicted. Look at this two forecast. The first one is from October 2014 (check the URL name), the other from December 2016. 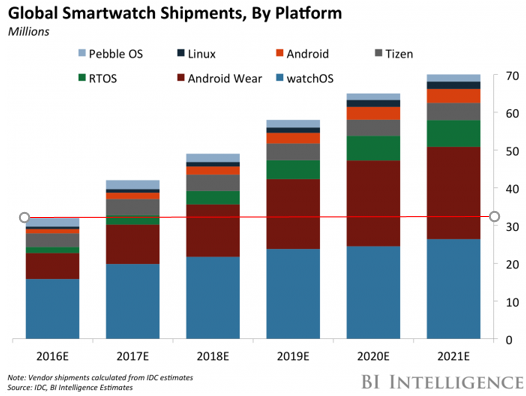 Back then the estimated market for smartwatches by the end of 2016 was more than 70M units a year. It’s effectively less than half of this, which is the numbers the forecast initially predicted to be reached as early as early 2015. A two years delay for a three years forecast! New markets are extremely hard to forecast and, more often than not, pundits forecast will be more on the optimistic than on the realistic side. To accelerate or even trigger the growth of a new product for a new use case (whether to address a real customer pain or just to offer a cool experience that will make life somewhat better) it’s much smarter and quicker to attach this new feature to a product you already want or, even better, need (like the STB for the Direct TV / TiVo example). Another good example of the latest is the new personal universal translator that Microsoft Translator enables with its new live feature. Of course, we initially thought about building a dedicated Star Trek looking (or Babelfish looking!) devices just for this scenario. However, bundling the feature in a smartphone and tablet app (the Microsoft Translator app) and a browser (http://translate.it) to leverage devices and apps users already had and were already using was a much faster way to speed up adoption. Are they counter examples? You bet! However, even seemingly overnight successes are often closer to matching the points 2) and 3) above than you may think. With Amazon Prime Music, Pandora and Spotify, the most popular music services are available on Echo. If I already am a customer of one or more of these, the Echo is a simple extension to better enjoy something I am already paying for. Ditto if I use Hue lights, a smart thermostat, etc. What is your perspective on these points? What has been your experience dealing with third-parties forecast on new markets you were entering? This entry was posted in Business - Marketing on January 14, 2017 by Olivier. Once the base storage and communication processes are in place (see part 1), the next step is, arguably, the most critical one: to optimize the communication with the organization’s supporters. One key element that we quickly recognized is that people are different also in how they want their news. Some are more email centric (by articles, daily summaries or weekly newsletters), others are all about Facebook, other about Twitter or LinkedIn and some are still hard-core RSS fans. To ensure we would make it easy and effective for people to follow us we had to find a way to target all these in a way that would be effective. Use the capability of MailChimp to create an RSS-content based email blast. Once a week, MailChimp will automatically fetch all the new articles from the blog since last week and put them in a pre-formatted email (newsletter-looking) that will be then be sent to all the subscribers. Not only MailChimp will build and send the newsletter, it also manages subscriptions and unsubscriptions for us. A true zero-touch newsletter. We even used out ufeseattle.org domain to build a friendly URL (news.ufeseattle.org) for people to access the customized sign-up page we easily built on MailChimp. All the rest is done automagically: Post on Facebook, Twitter, LinkedIn Profile (not group), RSS feed, email for subscribers by email to the blog itself, and once a week a newsletter with all the articles in it. However, as Facebook filters page’s posts and both Twitter and LinkedIn create very large news flows, it’s easy for people to miss some news. Therefore, we are encouraging people to subscribe to the newsletter, the only way to ensure they will get the info and won’t miss it (unless they never read their emails of course ). This entry was posted in Computers and Internet, Getting Things Done - Personal growth and productivity on January 8, 2016 by Olivier. How to run a small non-profit core processes on virtually no budget? A few years ago, a small group of us took the leap of faith and launched a not-for-profit organization to welcome, support, and foster the Puget Sound (Seattle’s region) French and French speaking community. And finally, find a way to share content of all sort with our community. After some tests and trials and errors we converged, thanks to the help of a few free or low cost tools, to a solution that is scalable, fairly simple to maintain, and efficient from a cost and effectiveness standpoint. Then the rest, as it was coming up. 1) Branded site and email addresses. This is the only actual spend ($25 a year) that we needed. For this amount we opened a GoDaddy.com account that provided us with the ufeseattle.org domain (with free URL forwarding), and as many as 100 free @ufeseattle.org forwarding email addresses. For this one, as a Microsoftie, the solution was quite obvious too: Outlook.com and OneDrive.com (at that time Live.com and Skydrive ). The former provided us with an UFE email, the latter, with lots of free storage, to put events photos, documents we share with the community, but also private folders shared with the board or specific volunteers for any documents we had, such as our list of French speaking babysitters. Using the GoDaddy feature of forwarding specific emails to multiple ones, we were able to create a board-level @ufeseattle.org alias, by just having this email forwarded to all the board member’s own @ufeseattle.org alias. This also allowed us to use a simple contact (at) UFEseattle (dot) org email address instead of having to use the Outlook.com address itself. Then, with a simple rule in Outlook.com, each email sent to this board alias is automatically moved to an “archive” folder in the organization’s outlook.com email. This allows each new board member, at any time, to go back and check every single email the board exchanged from the association launch to his or her arrival. An easy and effective way to get more context on previous discussions. For that we went with the free WordPress.com sites. Not only it allowed us to create a blog (with its automatic sign-in for email alerts when new posts are published) but also a set of webpages with different type of relevant information for our followers. What was trickier to manage was the lists (Addresses, etc.) that we wanted to build. As we started these were small and we needed an easy way to update them. Always updating a WordPress page was not the most effective path. The solution to this was a small “hack”. This entry was posted in Computers and Internet, Getting Things Done - Personal growth and productivity on December 11, 2015 by Olivier. Hacks, or how to achieve good (not bad, not great, but good) results in an innovative, perpendicular or out-of-the-box-thinking way has moved from programming to other domains. Life hacks are one of them. Cooking hacks too. I love tasty and healthy food. I don’t mind cooking. I actually like it as it’s really relaxing to me. But, sometimes, if I could go 90% of the way quality-wise, but having only a portion of the work to do or time to spend I would definitely do it. Here are three of these hacks that will bring you 90% or more of the way with a fraction of the effort (but not always total cooking time!) in term of your own time. Hash browns can take quite some time to cook, and you need to stick around to ensure they don’t burn. Here is a nifty trick: use your waffle maker for cooking hash browns! Shred your potatoes, season them. Because each dent and bump (the waffle shape) is heated, each shred of potato will cook, while none will be burned (well, unless you forget it in the maker). Cool waffle shape, you can serve them as-is, fill them with things (scramble eggs, meat and veggies stew, sauce, etc), cut them in half diagonally to make them look even better, etc. Add wine and simmer at very low temperature for 3-4 hours. then put the whole mix (beef, onions, carrots, herbs, wine) into your slow cooker. Come back 6 hours later to perfectly cooked (i.e. melting in your mouth) beef Bourguignon. No need to watch it at all. The only little extra work you may need is to boil the sauce a few minutes in a pan to thicken it. This is a great hack for a workday dinner parties. Just wake up 30 minutes earlier, do 1) and the dinner is ready when you’re back (and the house smells awesome! ). note: it’s very important to brown the meat first as this action develops (caramelization and Maillard reaction) lots of flavors. Similarly to the Beef Bourguignon, just brown your veggies* and a bit your Arborio (risotto) rice in a pan, then transfer it all in a rice-cooker filling it with a bit of white wine and chicken stock. * My personal favorites are: Porcini or Chanterelle mushrooms, zucchinis (they will disappear in the process, melting with the rice this way children don’t even know they’re eating veggies), onions, garlic, red pepper slides. No need to steer and add water every few minutes. It will come out creamy (thanks to the Arborio rice starch) and ready to eat 20-30 minutes after. Note: you may need to add a bit of stock or water at the end before serving to release the creaminess of the meal as the rice cooker will have evaporated a lot of the moisture. Just pour a bit of the liquid in the rice cooker, stir and serve (with Parmesan of course). If I find other hacks I’ll share them with you and if you have other ones feel free to add them in comments! This entry was posted in Vie Quotidienne on October 10, 2015 by Olivier. SAAS, or cloud business in general, is profoundly changing business dynamics. I won’t go into details as these changes are really well documented. The one element, though, that I haven’t see mentioned so far is that it’s interesting to see how all the traditional business functions have all evolved from discrete time and objectives-bounded activities (with a clear start and finish) to more continuous ones. Engineering, sales and marketing all have embraced models where their core business processes (product development, marketing campaigns, sales engagement) are now continuing much farther than what used to be their end point. In product development, it’s well known that Amazon engineers are on pager duty to be able to jump on and fix the code they write if an issue is reported. On the other side of Lake Washington, under Satya Nadella, Microsoft has eliminated its 30 years old model of the Developer-Test-Program Manager trio for a dual Dev/PM one where engineers are responsible to code and fix their features (vs. throwing it to test/QA for them to see if it was working correctly). Similarly, sales for cloud solutions now involve moving from mostly hunting, to hunting and nurturing deals. This is necessary to ensure that, once deployed, customers are fully satisfied and continue (and hopefully increase) usage of the service vs. cancelling their subscription after only 3, 6 or 12 months. My good friend Jacco van der Kooij just published a great book going through the best practices relative to how to design your sales teams for a SAAS world so I won’t elaborate further. If you are interested in sales-related aspects for SAAS businesses I advise you read it’s fascinating book “Blueprints for a SaaS Sales Organization”. Finally, Marketing has slowly evolved in this direction of continuous campaigns as well. From a classic prepare-launch-move to the next product launch, marketing has evolved to a continuous process too. Now, campaigns never end but go up and down in intensity (you never want to let the wheel stop spinning), where people move from product launches, to regular content publication, to social engagement, to the next minor or major upgrade of the product, etc. Maybe the term “Go To Market” is not the more aft to describe what’s happening anymore. Maybe Go and Grow To Market? (GGTM). Either way, this also has, similarly to what’s happening in the sales and engineering organizations, impacts on roles, organizations and metrics. How are you adapting your metrics to these changes? In particular when a particular one (say webpage impression, app downloads or service trials) is a combination of a business as usual result with several marketing activities running in parallel. To conclude on these parallel changes, an amusing analogy is that all the core business processes, as we moved from installed software to cloud based one, have on their end evolved from discrete digital-like activities (1,2,3…) to more analog-like continuous ones. Or from distinct Qantas to everlasting Waves, for the physics geeks amongst us. This entry was posted in Business - Marketing on September 18, 2015 by Olivier. After months of wait our Echo finally reached the Fontana household last week. As a Prime subscriber it was so inexpensive ($100) that I did not think twice about whether I needed it or not. It was just a fun thing to test. (note: it’s now back down to $150 for Prime Members, $200 else). First, if you are not familiar with Echo, think of it of Jambox, meets Siri/Cortana, meets an embedded music player. The set-up is really simple and straight-forward, similar to the Chromecast one. You plug it in a power outlet, go to the Echo setup site, sign-up to your Amazon account, connect to the Wi-Fi network your echo broadcasts, enter your home Wi-Fi credentials and that’s it! 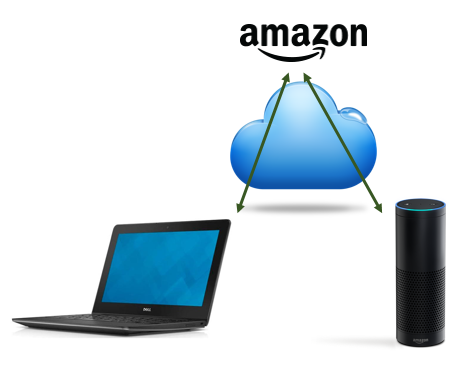 Echo will then be online and you will control it from your browser (or Kindle Fire app) via the cloud and Amazon backend (see diagram below). Now what can you use it for? First, it’s a fairly good wireless speaker (hence my Jambox analogy) with really good 360 degrees microphone (it also comes with a wireless remote with microphone on it for when you’re really far from it. But so far at up to 5 meters it works great). After 10 days this is by far (80%+) how we use use Echo the most. Just as an easy to use media player+speaker. Which is already really nice and worth the $200 current list price. You can also control and search music from the app or a browser if needed. Ask a random question: “What is Barack Obama’s age? “, “ How many people live in Washington state”, etc. It’s similar to what you would do with Siri or Cortana but – at least for Cortana- with an even lower success rate unfortunately. It’s a V1 product so let’s be patient here… There are also a few Easter eggs (such as “who’s your daddy”, but not as funny an answer as with Cortana) if you want too look for them. Add something to a shopping list. 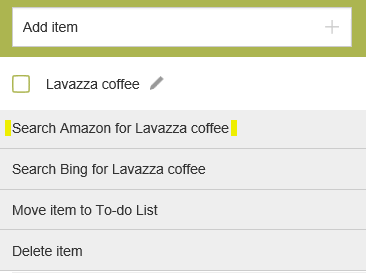 It’s one plain list too so I don’t plan to use it to replace the current per-store list I maintain on a family OneNote, but it’s a nice add-on for when you hands are taken while making food and your don’t want to forget to purchase a missing item. 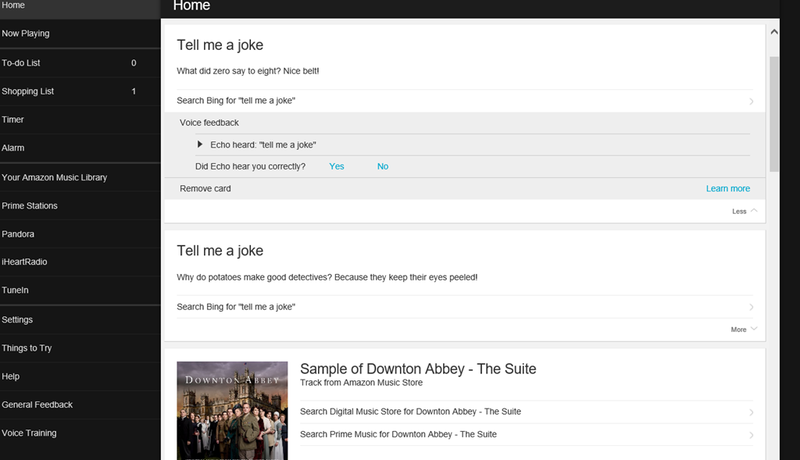 On the last one I finally understood what was in it for Amazon with Echo: under my shopping list item a “search on Amazon” was displayed on the web interface. I was able to click to get on Amazon’s search results, select, purchase and got it delivered for free (remember, I’m on Prime). Very smart move from Amazon! Following this I tried to purchase some music directly from Echo. It worked..ish. I finally was able to purchase it but it took me maybe 15 tries before I found the right way of asking for it. Still some progress necessary here though the concept is interesting (especially for Amazon top line). Nice little security feature: you can setup a pin through the web interface. Pretty useful if you have little kids at home I think. Finally, Echo supports Bluetooth connections with phones, tablets or PC. Not only it’s a cool feature on its own but, if worse comes to worse, you can repurpose it as a Jambox-like device and stream music or anything from your device to Echo. One feature I’m missing though is the ability for Echo to support the headset Bluetooth profile to be able to use it’s amazing microphone array and good speaker as phone or Skype external speaker and mic. Something my Jambox can do. This entry was posted in Computers and Internet on May 1, 2015 by Olivier. What PC should you buy? Having been in the technology industry for so long, and specifically Microsoft for the last 10+ years, I often have friends, family or even random encounters at social gatherings asking me about which device they should be buying. With the launch of the new Surface 3 this is even truer than ever. So, if you are in the same situation, here is the types of questions (and my answers) I usually ask people to help them make their choice. Disclaimer: I’m talking here about Windows devices. Even if Macs are actually really good Windows machines, my focus will be on the Windows ecosystem. You will also see that my guidance is more about form factors than actual devices (with the exception of the Surface 3 pro that I call out by name as it’s -so far (may 2015)- quite a device type on its own). To help people chose I usually start with the following questions. Unfortunately, with 4 questions and not being on a simple 0-10 axis, a simple 2-D graph cannot be used to directly map the answers to a particular device. Still, answering these questions should help get someone to the best possible device for his or her needs and budget. What is your budget? A $300 or a $2000 target budget modifies the options quite a lot! On your coach at home, on a plane entertaining yourself, on a treadmill – all types of “content consumption” scenarios. I will use this framework applied to a few particular scenarios to show how I come to my conclusions. No rocket science here, just a bit of structure. Traditional desktop machine, whether a low, mid or high-end one. Usually, question 4) is the one to get started with: how will you use your device the most? A: A typical knowledge worker, I’m working most of the time on my office desk with my large 23″ display but I regularly go to meetings where I present and/or take notes. I also need to be able to works for several hours in a row on my laptop when I travel. Finally I seldom use it as a passive consumption device, except maybe in the plane. I don’t really run CPU-intensive apps (like CAD, Video Editing, development tools…) but I often have multiple apps open and running such as Outlook, OneNote, several Browser tabs, Skype or Skype for Business (or both! ), PowerPoint, etc. I have a typical corporate budget for this machine. B: I mostly work at touch-down spaces or at Starbucks. I do lots of my email and prep-documents reading while on my treadmill or watching TV in the evening. I don’t want to spend much on this device. C: I’m a stay at home mom. I don’t really have a desk so I need to bring my machine from a storage place (shelf…) to the dinner table. I don’t really use it for any content consumption, mostly to take care of kids and house stuff so my typical apps are my browser, Word, Outlook, Skype and I love to have some music playing in the background (Pandora, Spotify, etc.) while doing this. D: I travel a lot, use my “free” time (such as plane rides) to code some new cool tools for my product, and like to watch Netflix in bed on my device. I can spend around $1,500, give or take a few hundred dollars. I could probably come up with another dozen examples but these should suffice to explain the thinking and decision process. I’m working most of the time on my work desk with my big display => Need to use both my internal display and an external large display(s) therefore a PC with a graphic card powerful enough to drive this/these display(s). Regularly go to meeting where I present and/or take note => Avoid laptops with display sizes >14” else it will be too cumbersome to walk around with. Need to be able to works for several hours from the laptop when I travel => Need good battery life (so SSD definitely better than regular HD), and a display large enough that it is not too strenuous on the eyes. I personally find 13.5-14” to be a good size/legibility compromise. I don’t really run CPU-intensive apps (like CAD, Video Editing, development tools…) but I often have multiple apps open and running such as Outlook, OneNote, several Browser tabs, Skype or Skype for Business (or both! ), PowerPoint, etc. : Lots of editing, so I want a real full-fledge keyboard for my travels (for meetings a Surface-like keyboard could suffice but if I do a lot of data entry I’d rather go for a real keyboard), and enough memory and CPU power to have all the apps opened at the same time. A 13-14” 2-in-1 would be probably the best option for this person. Alternatively, depending on the budget, (s)he could also go the 2-devices route with a cheap 8-inch tablet (such as the Dell Venues) for content consumption, and a regular low to mid-end laptop for the rest. I mostly work at touch-down spaces or at Starbucks => A real laptop is needed to get a decent sized display and a real keyboard. However it should not be larger than 14” for portability reasons. I do lots of my email and prep-documents reading while on my treadmill or watching TV in the evening => 2-in-1 to be in Tablet mode for your treadmill/TV, or buy a second, inexpensive, 8” tablet. The beauty of this 2-devices solution is that even a cheap $200 Windows 8/10 tablet supports all your PC apps and can be used as a spare device (in case of problem with the first one), or for “just in case” times when you don’t want to carry your main machine (weight, size, risks of being broken or stolen) but where a 8” tablet, maybe with a small mobile keyboard, can work good enough for a little while. You can even plug this tablet at home or work to an external display, a keyboard and a mouse and use it as a full featured –though not very powerful- desktop PC! A 14” to 15” low to mid-range laptop is probable the best bet. I don’t really have a desk so I need to bring my machine from a place I put it away to the dinner table. => Need a laptop/Tablet/2-in-1, not a desktop or all-in-one, to be able to use it around the house then store it when done. I don’t really use it for any content consumption => No real need for a Tablet or 2-in-1. I don’t want to spend a lot => An inexpensive (<$500) laptop would be sufficient here. 14” or 15” will provide her with enough screen real estate to work comfortably and as weight and size is not an issue, would cover her needs from a mobility standpoint. Scenario C’: What if she does want to do the same plus lots if content consumption (web, videos, etc.) while not on her kitchen table? In this case, as content consumption becomes important, a device like the Surface 3 (not Pro 3) would be a good bet if the display size (10.5”) is sufficient. Affordably priced ($500), she could use the nice type-cover keyboard, or if she wants a cheaper/better one use any $20-$40 Bluetooth keyboard. This Atom-powered Surface 3 and its small display could be the best compromise in this case. However, this won’t work if the 10.5” display size is too small. The alternative in this case, for probably a total budget of $100 more or so than a Surface 3 + keyboard, she could also find both an inexpensive Laptop and an 8” tablet and buy both. The obvious advantage of the 1-device (Surface 3) solution being that if she also plan to carry the device around this is a much more convenient (keyboard, weight…) solution than the 2-devices one. For this scenario, depending on the user, either a 2-in-1 or Surface Pro 3 device would be the best bets. I travel a lot => Has to be a light device with good battery life. Use my free time (such as plane rides) to code some new cool tools for my product => Powerful (i5, i7) machine. Not an Atom processor. Also a real keyboard. I can’t use an onscreen one only. Like to watch movies in bed on my device => should be able to easily go into tablet mode. Depending on the person own preferences or priorities (including budget), the scale will tilt towards the 2-in-1 (potentially larger display, better keyboard, potentially lower cost) or a Surface Pro 3 like device (weight, width, ratio consumption/production of content). Either one of them could them have a docking station/USB 3.0 port replicator at home or work for desktop-like usage. A nice icing on the cake. There is no one-size-fits all device. That’s one of the reasons I prefer the Windows ecosystem to the Mac one. Scenarios, budgets, etc. all have influence on what the best device is. Hopefully the framework above and the examples I gave will help you find you “perfect” device(s). If you have a specific scenario not covered here and you can’t figure out what to buy using the framework above, leave me a comment and I’ll try to help you figure this out. Just answer the questions 1 to 4 above first. This entry was posted in Computers and Internet on April 3, 2015 by Olivier.